Two massive security flaws have been found in Apple and Android products that could enable hackers to grab your data and private information. The first vulnerability is a zero-day alike bug in OS X and iOS that enables the hackers to steal both application passwords and Keychain (the password manager). The vulnerability, initially got disclosed in form of an academic paper released by a group of researchers from Georgia Institute of Technology (commonly known as Georgia Tech), Peking University and Indiana University, spotted a flaw in the latest OS versions of Apple that allows an application to download from Apple app store for gaining illegal access to different applications. The Register initially published the news of this research, which stated that Apple was firstly informed in Oct 2014 and then Feb 2015 – the firm asked experts to hold off the secret for 6 months. The team went through tests to back all of their findings, Apple app store’s restrictive security checks were successfully circumvented – and in last June the app store even permitted their malicious applications. The researchers claim, almost 80% of the applications were totally vulnerable to the attacks. On the other hand, NowSecure’s researchers revealed they had found a major flaw in a 3rd party keyboard application that is already installed on over 600 million smartphones of Samsung – latest Galaxy S6 is no exception. The security flaw enables hackers to remotely get access to camera, GPS, microphone, outgoing messages, incoming messages, secretly install malware, pictures and voice calls. Switch Keyboard is the application that’s having security bug causing all the problems and a privileged account on Samsung mobiles is needed to run the app, explained Ryan Welton. To exploit the vulnerability hackers need to control or compromise the network to whom the mobile is connected, just like a local network or wifi hotspot. 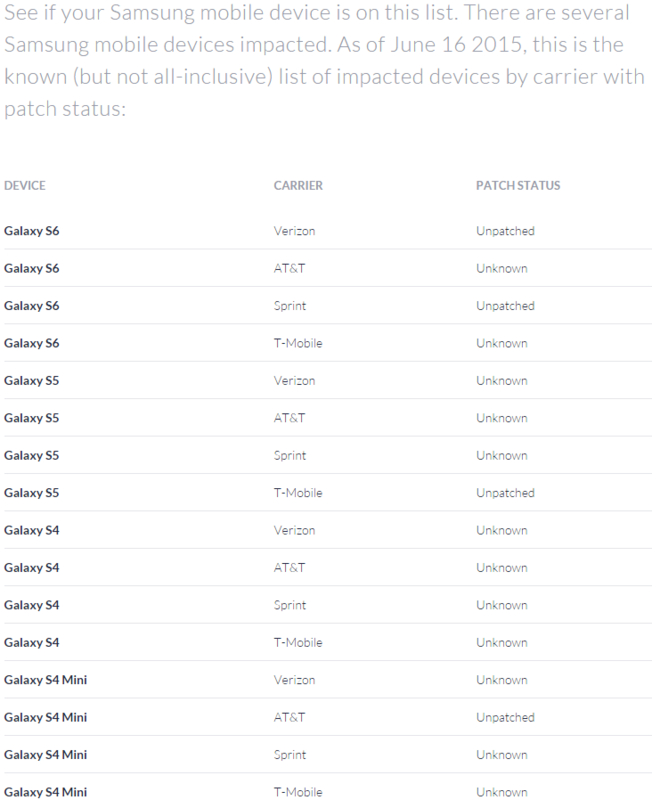 A list of Samsung mobiles indexed by patch status and their private carrier has been released by NowSecure. As any other company on such incidents might have said, a statement from Samsung were released claiming that the company takes concrete measure against these security threats.